This book reminds children of the real meaning behind Christmas carols--the birth of Jesus Christ. 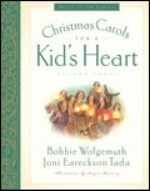 It introduces twelve carols and shares the stories behind each one. The enclosed CD contains fully orchestrated versions of the carols with children’s voices. No other time of the year is filled with as much excitement and gleeful expectancy as Christmas, and no one seems to enjoy the season more than children. Christmas is a time for making memories. And musical memories are one of the most precious gifts we can give the children we love. Be inspired by the true stories of the songwriters. Connect with tenderly written devotionals. Learn to sing twelve classic Christmas carols. Practice piano and guitar with printed music. Understand more about God’s character and grace. Memorize a Bible verse with each hymn. Learn to pray along with their singing. Give children a lasting musical treasure. Experience the pleasure of filling young hearts with joy. Be equipped with the tools to teach children twelve classic Christmas carols. Enlighten young people with an understandable theology. Enjoy prayer and Bible memorization along with kids. Includes a fully orchestrated CD with children’s voices singing along with Joni and Bobbie, and simple piano music with guitar chords.